Have you considered leasing photography? your office with local and period specific artwork. Layers, Two Jack Lake in Banff, AB. 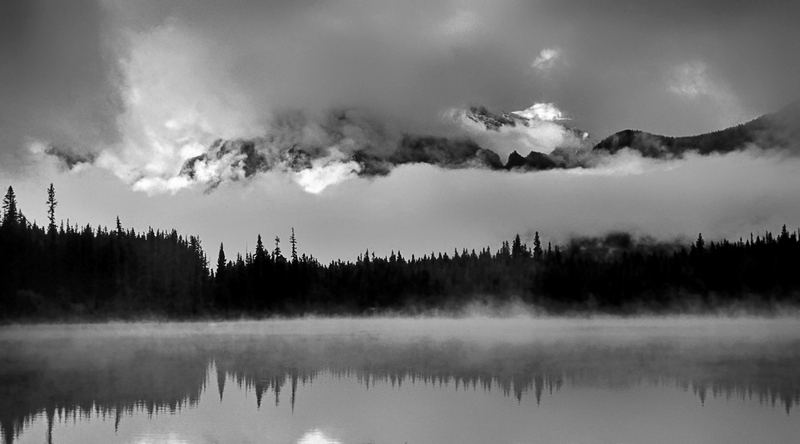 A tribute to Ansel Adams. The quality of the decor in the private and public areas of your establishment can elevate your guests’ experience and the wow factor when they stay at your beautiful property or visit your professional offices. The finishing wall decor in your public and private areas can inspire your customers to extent their stay to further explore and enjoy the Canadian Rockies as they seek out the locations in these photographs to see and photograph the spectacular scenery highlighted in the photographs decorating the walls in your hotel lobby and rooms. Quality, regionally specific photographs can separate your property/business from your competition’s, who may still be using generic and outdated artwork to decorate their rooms. Generic and dated artwork finished in out of style framing lacks the icing on your venue’s cake that will help your customer to form that special connection between your venue and their everlasting memories of the Canadian Rockies. Dressing up the walls in your office can also have a calming effect during your hectic work day and communicate a message of competence to your employees and your customers. Not to mention, your clients will likely comment when they admire the dramatic photographs and finishing of our Limited Edition Fine Art line of beautiful framed photographic art. Finished pieces in the limited edition fine art series are already sized and beautifully framed. Photograph printed sizes range from 10″x 24″ to 32″x 48″ and are framed with the best elite fine art wood framing available. Decorating the public areas of your hotel, and the rooms, with photographs featuring the landscapes of the Canadian Rockies that your guests will see as they explore the area will help them to develop an undeniable association between your property and the spectacular scenery of the Canadian Rockies. ****When they later think about their visit here, and when they tell their friends about their amazing trip here long after they’ve gone home, they will also tell them about your property since they’ve made an associate your property with those good memories while visiting the area and viewing the beautiful scenery around our incredible home. *****This associate between the landscapes they will see during their stay here, coupled with the same landscapes they can see featured in the artwork hanging on the walls in their hotel room helps them to develop the connection between their treasured memories and your property. This will help them to develop a great impression after staying in your comfortable rooms decorated with attractive, local, and period specific artwork featuring the Canadian Rockies. This association can easily generate repeat business and recommendations to their friends and business associates to stay at your property for years to come. WE all know that sometimes the accents of the decor can separate a good venue apart from an incredible venue. Giving the proper attention to decorate your rooms and the public areas throughout your property can help your guests to develop a sense of place and create the atmosphere of the Canadian Rockies on your venue grounds. to five diamond standards is a little hard to find, and it is not cheap to purchase. I have a collection of Canadian Rockies specific photographs in a variety of framing finishes, that can be leased for a very affordable monthly price at a fraction of what it would cost to purchase the artwork outright. This will keep your costs low, but the quality of your room decor high. This is a path to profitability. Lease beautiful artwork at a tiny fraction of the price to buy it. Another benefit to leasing artwork for your walls is that you can switch the artwork up during the slower seasons while conducting annual or biannual room maintenance. You’ll never have to worry about your decor going out of style because during the shoulder seasons you can have your maintenance staff change some, or all of it for a small charge to cover the cost of the time involved for me to manage the artwork change order. Photographs range from 12″x18″ in size, matted with 5mm (0.2″) thick 12 cm (5″) white matt, and framed in a stylist 2″ (5 cm) black wooden frame. The finished dimensions of the framed photographs range in size from 26″x18″ to 31″x23″ (WxH). The are framed in modern black metal or wood frame with 5mm glass which are easy for housekeeping to clean quickly. The elegantly finished, framed photographs fit well in classic or modern room decor themes.